WEST PALM BEACH, FLA. – Oct. 14, 2016 – Global professional services firm, Brooks International, is pleased to announce it has just received the “Fastest Growing Firm” award from Consulting Magazine. Headquartered in West Palm Beach, Fla., Brooks International was recognized as one of the world’s fastest growing firms at an awards ceremony and dinner on Oct. 13 at the landmark Roosevelt Hotel on Madison Avenue in New York City. Last year, Consulting Magazine released the first-ever ranking of the consulting industry’s fastest growing firms in North America – a celebration of the industry’s top players in terms of revenue growth over a three-year period. This year, the magazine expanded the honor to include all global consulting firms of any size and sector. 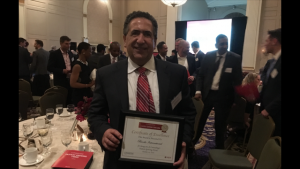 Brooks International’s Chief Executive Officer Luigi Damasceno and Managing Partners Tom Lonergan and Mark McTigue were on hand at the awards ceremony in New York City to receive the award and formal acknowledgement as one of the top movers and shakers of the consulting profession. Consulting Magazine will feature the honorees in its November 2016 issue. According to Damasceno, “Brooks International is on track to achieve a 30% increase in revenue over last year.” One of the factors that contributed to the firm’s exceptional growth has been Brooks International’s reshaping of its approach to market and offering. “Due to a lingering flat economy, many top lines are struggling to grow. By consequence, our offering has emphasized the need for revenue enhancement via both organizational effectiveness and efficiency,” he said. Headquartered in West Palm Beach, Fla., with additional locations in Canada, Europe and Asia, Brooks International creates and delivers Execution Excellence to its CEO clients. Brooks International partners with industry leading Fortune 500 clients to deliver significantly enhanced profits and predictive business performance as well as substantial and sustainable organizational, operational and financial improvements. A global professional services firm. Brooks International achieves its clients’ strategic imperatives by linking financial and operational models, consistently delivering predictable business performance. Brooks International dramatically enhances clients’ execution methods, competencies and capabilities. They deliver significantly enhanced profits as well as substantial and sustainable organizational, operational and financial improvements … specializing in execution performance capabilities across all industries and sectors. For more details and case studies, visit https://brooksint.com, call 561.214.8800 or connect with Brooks International on Facebook or LinkedIn.